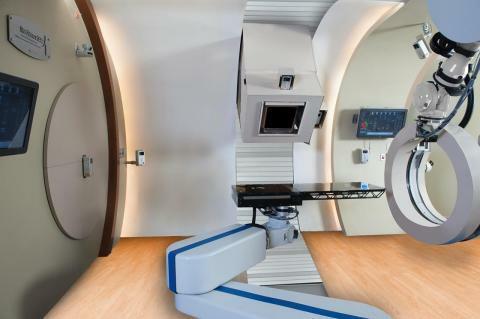 US-based ProTom International has received 510(k) clearance from the US Food and Drug Administration (FDA) for its Radiance 330 proton therapy system. The compact, modular and more affordable proton bean delivery system is designed for the treatment of patient with cancer. The Radiance 330 proton therapy system has the ability to deliver radiation with an exceptionally high degree of accuracy while sparing surrounding healthy tissue and anatomical structures. The modular design of the system meets the buyer’s preferences for 3-D imaging solutions and treatment planning software through industry-standard interfaces. The design of the compact synchrotron allows for accelerator interior vault space of approximately 20′ x 30′ and requires up to 40% less radiation shielding than most other systems on the market today. The Radiance 330 can be configured using its single, energy-efficient synchrotron to operate a single or multiple treatment room facility; treatment rooms can be equipped with isocentric gantries or as fixed-beam lines with one or more ports. ProTom International CEO and co-founder Steve Spotts said the receipt of 510(k) clearance is the final culmination of a thorough and rigorous FDA review of the safety and effectiveness of the Radiance 330. "This achievement accelerates our team’s single and relentless mission to place this highly sophisticated and targeted cancer-fighting tool within reach of many more physicians," Spotts added. "Our team couldn’t be more proud of reaching this milestone and will continue our work to advance the delivery of proton therapy while driving down the cost of this much needed technology."